The current worldwide water shortage, i.e. : Mississippi River drying up, that threatens potable water for a number of cities is but one small example of what is going on in the world. No matter if you want to take a political model of thinking and say it is man made or not, all the rhetoric pales into insignificance when you can not grow food on a massive agricultural scale, or even in your back yard. The focus of this past 28 years, or so, “study” of mine is to find a successful solution of water management suggesting to food gardeners a means to improve yields, use far less water than thought, and manage the garden with less work. The last part I like the best, as I am getting older and less inclined with arthritis to be grubbing in the millennial old ways of the hoe. Let’s get started. Notice the lead in first picture we are working with a flat area of about a US 1600 square foot area. The wall on the right is a terrace effect of another US 1200 square feet of space. The big picture is that the garden area is on a hillside and dug out into three terraces. The building in the end of the garden space shown is a barn with deer fenced yards. On the left is a half bed of asparagus and the remainder set aside for root herbs such as astragalus (Astragalus membranaceus). 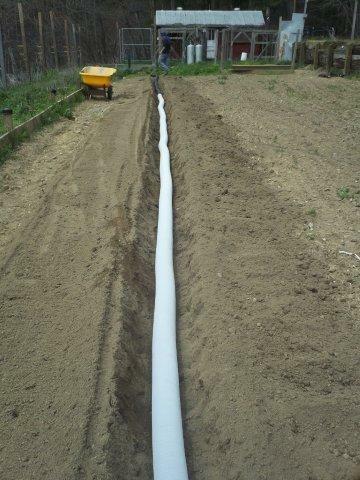 This bed, 4 feet wide is already constructed with underground slotted US 6 inch diameter water dispersing flexible pipe. We start with my 33 year old Troy Built Horse Garden Tiller. I till the area flat and smooth to the maximum depth of about 8-10 inches. Then I measure across the garden space from the asparagus bed wood walls a distance of 2 feet. This is a walkway. Next from this string line we measure 4 feet. This area is re-tilled as deep as we can go. Then we place the “Hiller-Furrower” on the rear of the tiller and make a long straight furrow down the center of this beginning bed. Of course this soil is heavily ingrained with years of composts and manures making it very ”rich”. One of the advantages of raising rabbits is the amount or fertilizer they produce to tone up bare spots. Ideally if you have enough bunny berries you could line the furrow with them as an earthworm sanctuary under the flexible pipe in the driest of weather. Once the furrow is made you might smooth it out a bit with a shovel. Ideally it ought to be fairly level as you will have a water fill pipe sprouting up at each end. Once the furrow is smoothed out it is time to take the slotted black plastic 6: diameter leach field pipe, (sold in 100’ rolls), measure the furrow adding a couple of feet for stretching. Cut the pipe and start rolling the white silt-sand resistant “sock” down the pipe, which will keep silt and sand out of the pipe over a period of years. 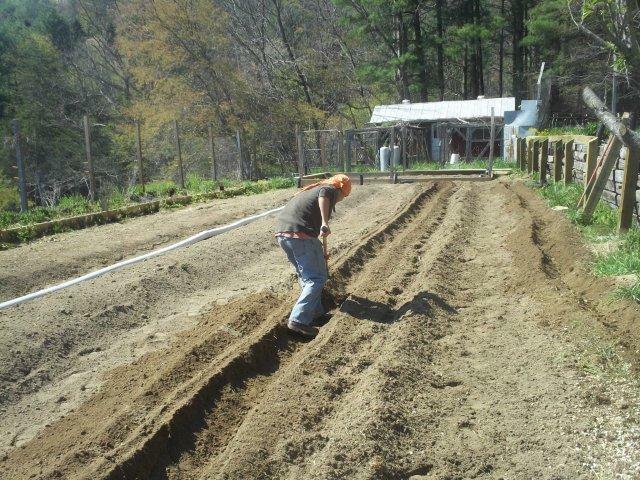 Next is raking the soil up and over the pipe forming a raised bed, or mound. The width of the bed in my long range plans hinges on the goal within a year, or so, of making a giant hoop greenhouse. To accomplish this endeavor of really low cost vs.: a commercial large hoop greenhouse is to make the outside bed 3 feet wide. The center bed, 4feet wide and the next outside bed, 3 feet wide. The width of these beds is consistent with how far you can reach. The ultimate goal of course is “steps” and the underground watering system is the first step. The next step will be to build up the sides with treated wood planks, or patio cinder blocks, but I am more inclined to use 2”x10”x10’ planks – treated lumber of course. This will be revealed in pictures maybe this fall as time permits and energy flows. In the mean time you can plant the beds as they are. Being a long range goal setter these wood sides beds, similar to the experimental 10’x20’ underwater hoop house shown in the archives will support the greenhouse plastic covering making a real greenhouse and saving thousands of dollars. 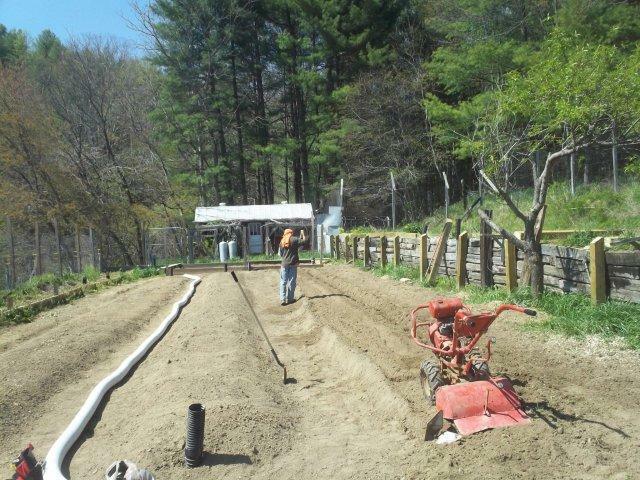 Note in this picture at the left the asparagus bed, the 2 foot walkway going back to the chicken house with the two 100lb propane tanks for brooding baby chicks if the electricity goes out. Of course with my new generator system that is unlikely, but I mention this as a visual aid. 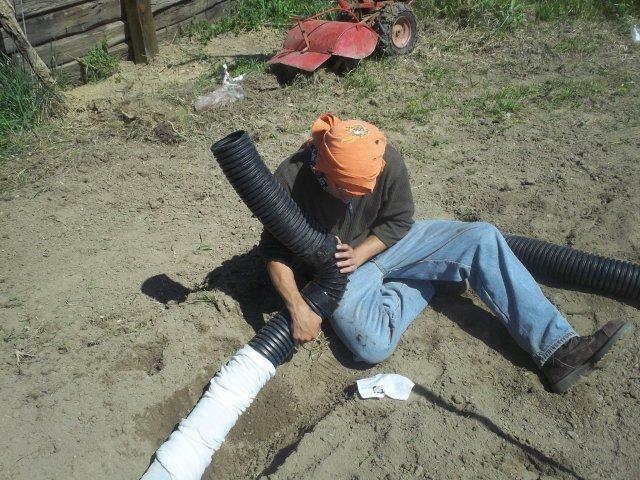 Note the 100-foot plastic flexible slotted pipe with the sock rolled on it. To its left is the first bed, to the right is the center bed with the pipe laid in and the end pipe sticking up in the air a couple of feet to access filling with water considering the run length of this pipe at a pumped from the pond rate of 10 gallons a minute I can fill this pipe end to end with drainage at 300 gallons in 30 minutes. The advantage is remarkable in watching the summer tomatoes and peppers leap upwards and start flowering. The top soil remains dry except for rain showers (which does promote weed growth) Overall at this point there is less work, less mess, less bugs, less weeds, less water loss as the water is right at the roots. So far I have been watering on a 5-day basis. I have not had to fertilize, but assuming I was to boost the plants with non- organic water soluble substance I could use Miracle Grow ™, as an example, mixed in a 5 gallon bucket and poured into the ends of the irrigation pipe about half way through the watering process for a good mixing. However, I have not done this yet as I want to consult with http://www.7springsfarm.com/ in Floyd for their products on line. Again from the water saving aspect 300 gallons is water saving far better than sprinkling thousands of gallons recommended by modern agriculture. 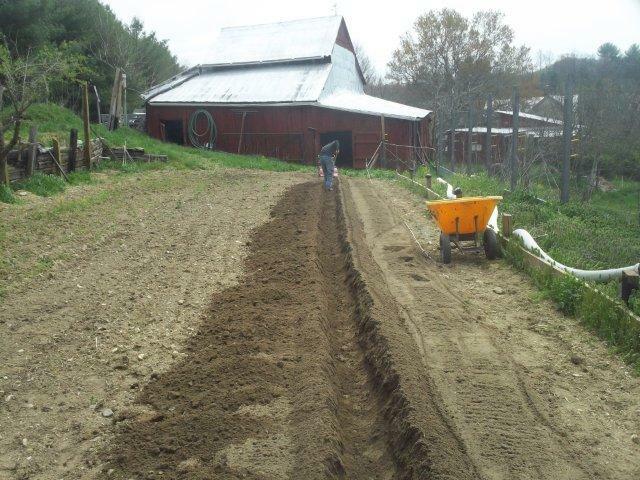 In this picture we note the barn and my helper smoothing out the furrow to lay in the covered pipe on the far right, this is the third bed. All three beds can be refaced to whatever exactness we want. In this last picture of the underground watering system note my helper snap coupling a 45-degree coupling to protrude the end pipes sticking up at the ends of the beds. A few thoughts. You might question the wide spaces between the beds vs.: narrow walkways. These are planting areas in the neighborhood of 4 feet or slightly more feet in width. As you fill the pipes water is unique it goes up and sidewise as well as down. Mostly it seeks dryness to the side and there is a complete bed watering for roots as well as some watering moving outward into the in-between, and the like. It is covered with a generous hay/straw covering that once kicked up you will notice dampness and happy growth of what you plant therein. I suggest pole plants, vine pumpkins and midget corn, the late Ruth Strout, an original writer of Organic Gardening back in the 1940-1959 era advocated planting in heavy mulch. She was right mulch conserves water. Any weeds you pull just go into the center aisles and they all rot adding fertilizer to the soil as pulled down by our earthworm friends. 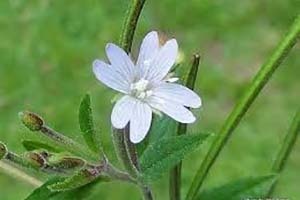 There are also living mulches you can grow such as clovers and what I have found good in the raised beds where wind driven seeds alight is to use the paper shredder ad gently tuck it around the plants. 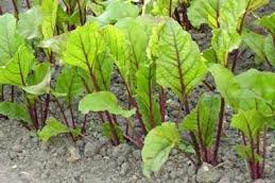 This blocks weed, feeds the earthworms (see my articles on earthworms “The Master Gardeners”). I have the upper bed to do yet and I want to make that into a deeper pipe system, which is tantalizing my dreams at this point. I realize most people do not have much space, but no matter what space you have you can grow some food and learn. Take a look at the pictures again of the barn. Notice the guttering I put up. This all drains into huge collection tanks, the overfill runs off down the hill as it has since civil war days. There is much ado about economic collapse and doom and gloom. 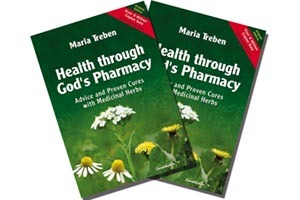 Trust me, there is no unhappy thoughts in the garden plus if you are a worrywart this is the best way to prep as well as encouraging the children to learn about life beyond the Mall. Children want to learn and they want to learn from you. Canning produce is a big step for them just as I remember my days as a child in Sweden during WWII. I have so many different requests to write about life on the “farm” beyond what I like to write about mostly: herbs and vegetables. I will try and get more of this in as time progresses. I hope this introduction to irrigation will be of interest to you and I will continue more on this subject as I build more and grow more.